Advance Booking of Sanam Re & Fitoor Starts in India; Book Your Tickets Now! 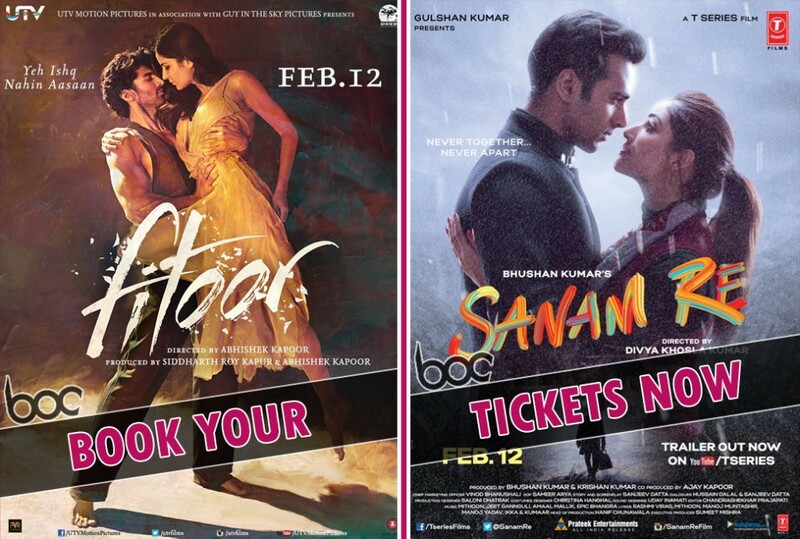 Pre-Booking of ‘Sanam Re’ & ‘Fitoor’ has Started! Another clash of Bollywood but this time genres are same, yes we are talking about romantic films ‘Fitoor’ and ‘Sanam Re’ which are all set to release this Friday worldwide. Abhishek Kapoor’s directorial Fitoor features Katrina Kaif and Aditya Roy Kapoor in lead roles, along with Lara Dutta, Tabu, Aditi Rao Hydari etc. in crucial supporting roles. The adjacent release Sanam Re is directed by Divya Khosla Kumar, who had directed Yaariyan. It features Pulkit Samrat, Yami Gautam and Urvashi Rautela in lead roles. Both the films have good hype among audience, one because of its star power and second because of its music. Directors associated with them are also the reason behind such good buzz. On the whole, Fitoor is looking more stronger than Sanam Re, as huge fan following of Katrina is enough to pull the film to the safe side. But it doesn’t mean that Sanam Re will not perform good. Initial buzz can give good start to the film but the actual journey depends on audience reactions, so we have to wait till their release day. Advance booking of the both films have already started from Sunday in selected cities of India and will get opened completely till Wednesday including multiplexes. As per reports, theaters are witnessing decent response for both the films. Those who want to book their tickets now, can make it done online as well as offline.